On Saturday’s UFC broadcast from England, it was announced that Michael Bisping will be inducted into the UFC Hall of Fame this July in the "Modern Wing". On Saturday’s UFC Fight Night broadcast from London, England, it was announced that Michael Bisping will be inducted into the UFC Hall of Fame this July in the “Modern Wing”. Bisping will be remembered as one of the enduring characters in the promotion’s history with a career that culminated with an improbably middleweight title victory in 2016. Bisping won the third season of the Ultimate Fighter, entering the show as a 10-0 fighter, who had been fighting professionally for two years. He stopped Josh Haynes in the June 2006 final and headlined his first UFC pay-per-view in November 2007. It at UFC 78 in 2007 the dropped a split decision to future light heavyweight champion Rashad Evans and led to Bisping’s decision to move down to middleweight. Bisping won his first three fights at 185 pounds before a knockout loss to Dan Henderson at UFC 100 in July 2009. The two coached the ninth season of the Ultimate Fighter leading up to the fight and was a heated rivalry, resulting in Henderson’s famous punch to an unconscious Bisping at the end of their fight. Bisping would be a polarizing figure, understanding his role as the villain in most scenarios with a strong understanding of the business element of selling a fight. There was a time he was the most-hated fighter on the roster after an incident during a fight with Jorge Rivera in February 2011 where Bisping spat towards Rivera’s corner as a receipt for a video Rivera did prior to the fight mocking the British fighter. It appeared Bisping would be known for having the most UFC fight without ever fighting for a title. When he lost to Dan Henderson in July 2009, Chael Sonnen in January 2012, and Vitor Belfort in January 2013, each fight was expected to lead to a title fight, if he had won. 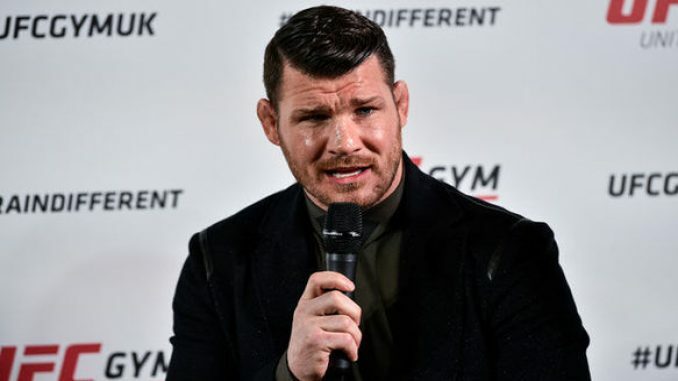 Years later, Bisping would become outspoken over the allowance of Testosterone Replacement Therapy (TRT) and citing these three loses to fighters that were allowed TRT in the cases of Henderson and Belfort along with Sonnen, who had several drug test failures in his career. After a submission loss to Luke Rockhold in November 2014, Bisping went on a big run with wins over C.B. Dollaway and Thales Leites before landing the biggest fight of his career in Anderson Silva. Bisping earned a unanimous decision over the former middleweight champion. With less than three-weeks until then-middleweight champion Rockhold was to fight Chris Weidman, an injury forced Weidman out of the fight and Bisping stepped in on 17-days notice. The result was one of the biggest upsets in MMA history with Bisping stopping Rockhold in the first round at UFC 199 and Bisping became champion at 37 years of age. Bisping would avenge his loss to Henderson later that year and lost the title to Georges St-Pierre at UFC 217 in November 2017. Bisping opted to come back three weeks after the St-Pierre loss and was knocked out badly by Kelvin Gastelum in what ultimately was his final fight. Bisping began working as a broadcaster for the UFC when they moved to Fox becoming one of the co-hosts of UFC Tonight. Bisping has added commentary to his list of duties for the promotion and officially retired last May.